Who are you and what have you done for Bongo? I started writing and drawing stories for Bongo in the summer of 2009 soon after I gave up my weekly strip, “WayLay.” After drawing one-page stories for eighteen years, it is an absolute pleasure to be able to stretch out and tell proper multi-page comic stories. And the story possibilities are endless in number with this huge and well-defined cast of characters. I’ve been at this for a little over a year as of this writing. My first story, “The Sound and the Flurry,” appeared in Bart Simpson #52. Other stories include: “Pandora Jr.” (Simpsons Comics Get Some Fancy Book Learnin’),“The Mystery of the Pesky Desk” (Bart Simpson #53),“Dirty Laundry” (The Simpsons Summer Shindig #4), “Fortunate Son” (Bart Simpson #54), “Planet of the Plants,” “A Tomb with a View,” “Sleepless in Springfield,” “Pranks a Lot,” and a 25-page story titled “The Princess Principle,” which will appear soon in Bart Simpson #55. I did another full-length story for Simpsons Comics #170 called “The Generosity Gene,” which will be out in September. Who is your favorite Bongo character in general? I love MANY of them, but I relate most to Lisa. Creative nerd, social goof – I get it. I devoured the anarchy of early Warner Brothers cartoons; Lisa loves “Itchy & Scratchy.” She wants a pony; I grew up on horses. Lisa plays sax; I play concertina. Granted, we’re not doppelgangers, but if I were 8 years old, we’d be tight. Okay, now who is your favorite Bongo character to write? It may be a tie between Bart and Lisa, but the dopey Homer and the pompous Comic Book Guy are also fun to write. And Marge. And Maggie. And Nelson. Milhouse. SKINNER. Smithers. Burns. Krusty. Krabappel. I like them all. And what character, if any, always poses a problem for you? Bart is the hardest for me to draw, still. The simpler the character, the harder it is to draw because if you’re a hairline off, everyone can see it on such famous figures. Bill Morrison and Terry Delegeane gave me and other “indie” comics creators the leeway to draw in our own styles, but if something has a model sheet, I want to draw it on-model. I’m still learning, and get great help from Bongo’s art director, Nathan Kane. What inspires you in your Bongo endeavors? Sometimes something bugs me, so I write about whatever it is in a story. For instance, “The Princess Principle” came about because I find the whole Disney princess thing troubling. The appetite for shallow, privileged materialism is sort of the opposite of feminism. Lisa would find the princess phenomenon just as vain and stupid, but she’s a little girl and gets sucked in for reasons we get to see in the story. Or a story I’m finishing up now, “Sleepless in Springfield,” wrote itself after two months of me not getting enough sleep. This is a cool job. If you ended up in Springfield on vacation, what would you want to visit? The Chili Cook-Off. I want what Homer had. What’s your favorite comic book sound effect? I have many favorites, but I just wrote one for a banana cream pie landing on someone who is already drenched in chocolate pudding: PLOOP! (These things sometimes need to be individually crafted.) My first story for Bongo, “The Sound and the Flurry,” was all about Bart trying to compile a glossary of sound effects for Comic Book Guy, so the sounds drive the plot. I got to compose my first Rube Goldberg set-up with actions and effects. And since CBG’s favorite sound effect is “Kracka-THOOM!,” that provided me with a dramatic hook on which to hang things. Sound effects are ESSENTIAL to funny book stories. They help with the timing of gags, lead the eye around the page, and can be funny just because of the way they’re spelled. One of my favorite EC stories is “Sound Effects!” from Mad #20, written by Harvey Kurtzman and drawn by Wally Wood. By the way, I like to draw and ink the sound effects because I consider them to be part of the art, and digital effects look out of place to me. My effects may not always translate to other languages well, but with Photoshop it’s easy for production to plug in a Swedish “BJONK!” for my English “BONK!” Or whatever. 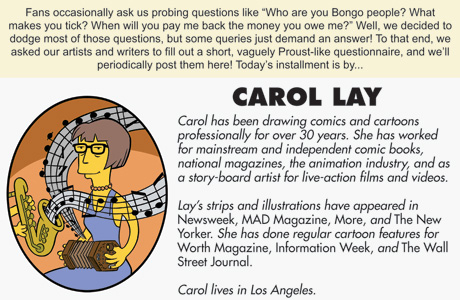 Do you have a favorite Bongo story? There are so many I haven't read yet, and I can't remember titles well, but I tend to like Chris Yambar's writing, among others. What would you most like Marge to cook for your dinner tonight? Marge's cooking seems similar to what I grew up on – lots of meat and potatoes with canned or frozen vegetables and a wedge of iceberg lettuce topped with faux-Thousand Island dressing (a mayonnaise and catsup blend). So I wouldn’t expect organic cuisine in the Simpson home, but I imagine Marge could assemble a great tuna casserole – forbidden comfort food. Canned string beans on the side, please, and strawberry shortcake for dessert.